Dromida Rally Car | Nerd Much? With the Christmas shopping season in full swing, let’s not forget about a type of gift that has been the go-to option for many years: RC cars. What makes RC cars such a great gift is that they’re so universal — everyone can appreciate them, including kids and adults. 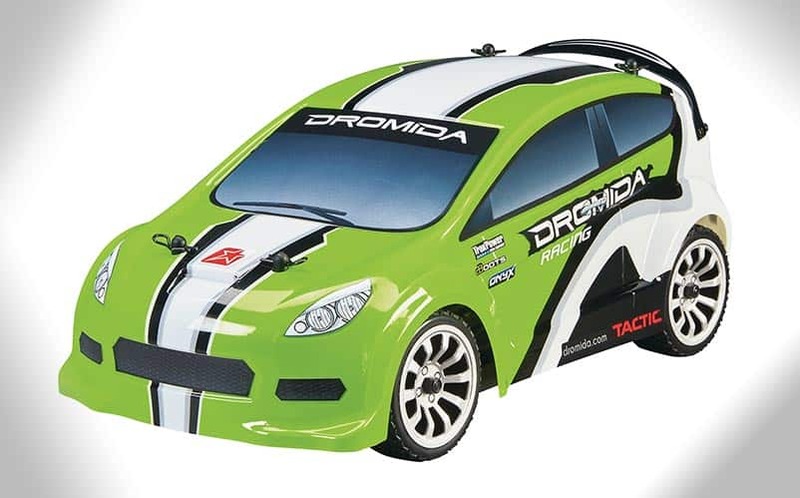 One of the best new RC cars of the year is the Dromida Rally Car, a small 1/18 scale 4WD rally car that packs a punch. If you’ve been following us on Instagram, you’ve probably seen all sorts of goodies that come to our front door, and one of our recent posts was a snap of this super cool-looking green rally car from Dromida. The Dromida Rally Car has equal parts speed and handling ability, and it sports a realistic rally car shell. It’s ready to run right out of the box, so beginners to the hobby don’t have to do any tinkering or tweaking; they can just open up the box, throw batteries into the controller, and they’re good to go. It’s also one of the more durable cars on the market, and whether you’re off-roading or driving down a local street, the Rally Car can take some serious bumps, thanks to its foam front bumper. Because of its super high-grip tires, the car does very well on dirt and on concrete, and although you can’t drive on any grass with it, you’ll have tons of fun with it thanks to its impressive brushless motor. In fact, taking it on a dirt road provided a much more satisfying drifting experience; nothing beats kicking up dirt at full speed. I’ll also note that it hit up to 27 mph in our testing — impressive for an RC car in its price range — and its acceleration is noteworthy; it hits top speed in mere seconds. Even the most seasoned RC hobbyists will appreciate the Dromida Rally Car’s quickness and agility, and it can also serve as a great first car for newcomers who want to leave toy store cars behind. The Dromida Rally gets our seal of approval for its high fun factor. For more info on the Rally Car, check out Dromida’s official site. Buy the Dromida Rally Car here. For more ridiculously cool nerdy stuff to buy, stay tuned to Nerd Much?. You can also follow us on Instagram, where we post just some of the cool stuff that shows up at our front door.